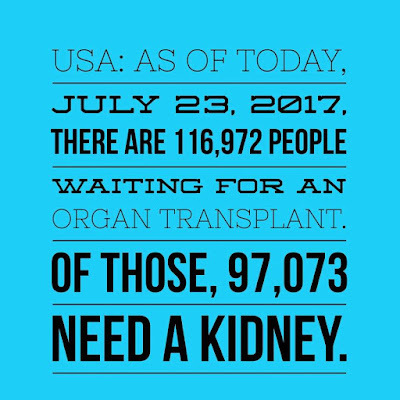 Searching For a Kidney Donor? Learn how to help a potential living donor find you. Live in the Atlanta Area? I'll be teaching this free presentation on February 16, from 1-2:30 at the New Beginnings Kidney Foundation in Conyers, Georgia. Too far to drive? No problem. Click on my upcoming events tab for speaking engagements and webinars. See you soon. 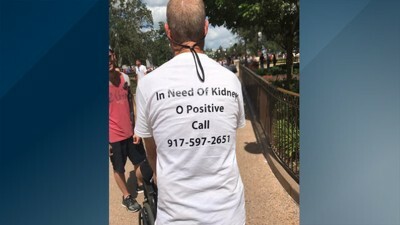 Need a kidney? Looking for a donor? One way is to tell your story. Sometimes, it can lead to a chain of events.Within the past month, Robert Liebowitz received a kidney. Did you hear how it started? He designed a tshirt and wore it when he and his family were at DisneyWorld. Apparently, another DisneyWorld guest, Rocio Sandoval, spotted the shirt and asked if she could take a photo and post it on Facebook. It went viral! Check out the links below to see how a total stranger, Richie Sully, saw the photo and became Robert's donor. Click to watch the kidney recipient and his donor on the Today Show, one week after the transplant. Click to read the article in the Atlanta Journal Constitution. It sure is an incredible story. What about you, the one searching for a kidney? How will you tell your story? 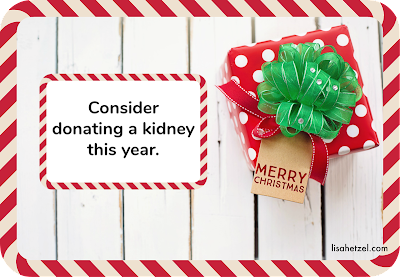 If you need help getting started, click to visit The Living Kidney Donor Network. If you are c curious about getting started, the previous link will help. If you need more direction, email me, lisa@lisahetzel.com I sure would be nice to see another person have a successful transplant. Not sure if everyone is going to be happy with the gifts that you've chosen? 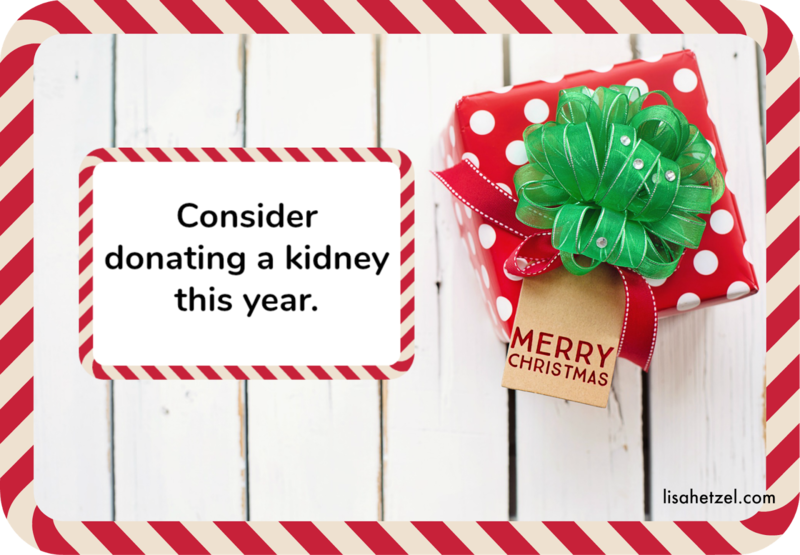 Have you thought about donating a kidney? I know, this post is written on Christmas Eve. Transplants from living kidney donors don't happen overnight. But, have you thought about getting tested? Some of you might be among the donors who have given. Some other readers might be searching for a donor. It is my deepest desire that everyone who needs a kidney gets one. But that can't happen without more living donors. There simply aren't enough viable kidneys out there. Even with the kidneys from deceased donors, there is a huge shortage. That's why I encourage you, if you're healthy, to consider donating a kidney this year. If you are the least bit curious, please contact your nearest hospital's transplant center. All of your questions can be answered and you can remain anonymous. There is no obligation. Of course, I'd love to chat with you if you want to know more about my experience as someone who donated a kidney. Three years have passed since the transplant. Both my recipient and I are doing well. Do you have any questions about donating a kidney? Let me know. I'd be happy to help you find the answers. Why Should You Register as an organ donor? Almost 120,000 organ donors are needed. I signed up as an organ donor years ago. Most likely, it was when I got my license. I really didn't think about it. My parents and friends were probably registered. Fast forward 40 years. Organ and tissue donation became personal. My cousin was in kidney failure and needed a transplant. Immediately, I ruled myself out because I thought that I was too old (learn why I wasn't on my "about" page). I checked my license to look for a note about being an organ donor. Technology advances have replaced the form on the back with a scannable fingerprint. I was probably still on an organ donor registry, but had moved and married. Would an address and name change make it more complicated? If something happened, and no one could speak for me, would someone take the time to scan my license and know my wishes? I visited my driver's license site and learned that a small red heart icon is printed on the front of organ donors' licenses. Mine didn't have one, so I ordered an update. I also made sure to tell my family and friends my wishes. As I started talking about this, I learned that several people I knew had received tissue transplants. My grandmother had cornea transplants, a friend had a new ACL and another had plastic surgery after serious burns. However, I was shocked to learn that many people die everyday because there aren't enough life-saving organs. According to DonateLife.net, "95% of Americans are in favor of being a donor but only 54% are registered." Click here to visit Donate Life's website. Since my cousins' kidney transplant, she has become a grandmother. Now, she takes care of her grandson. She looks great and feels incredible. On the other hand,I have a friend who has been dialysis for over 5 years. He is exhausted and is now on disability. Three times a week, he spends hours hooked up to machines. Dialysis doesn't last forever. He needs a transplant soon. What do you think can be done to help to meet the need for more organ donors? Why do people donate kidneys to strangers? Seems strange to many. Why would someone choose to undergo lengthy testing and an unnecessary operation in order to donate to a stranger? I've met several of these people. They're referred to as altruistic donors. 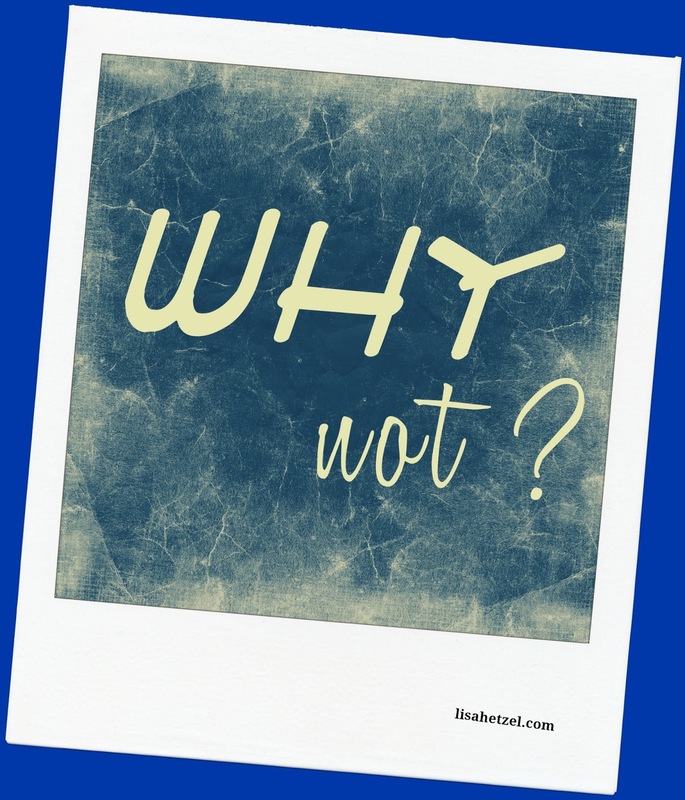 Many of them will respond to the question above with the same response, "Why Not?" Amazing. Listen to a few of them in this Youtube video. Click here to learn why some people choose to donate. Recently, I connected with Ned Brooks,an altruistic donor who shared his rationale at a TEDx event. Click here to watch Ned Brooks explain why, at age 65, he chose to donate to a stranger. Here's something else that's cool. Many of these people continue to promote living kidney donation. Ned is the founder of Donor to Donor. Visit www.donortodonor.com to learn how they help End Stage Renal Disease patients find compatible donors. 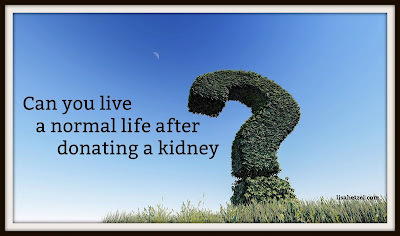 What would you like to know about kidney donation? I'm so excited! A fellow living donor sent me this decal for my car. She's on a mission to get one in every state. 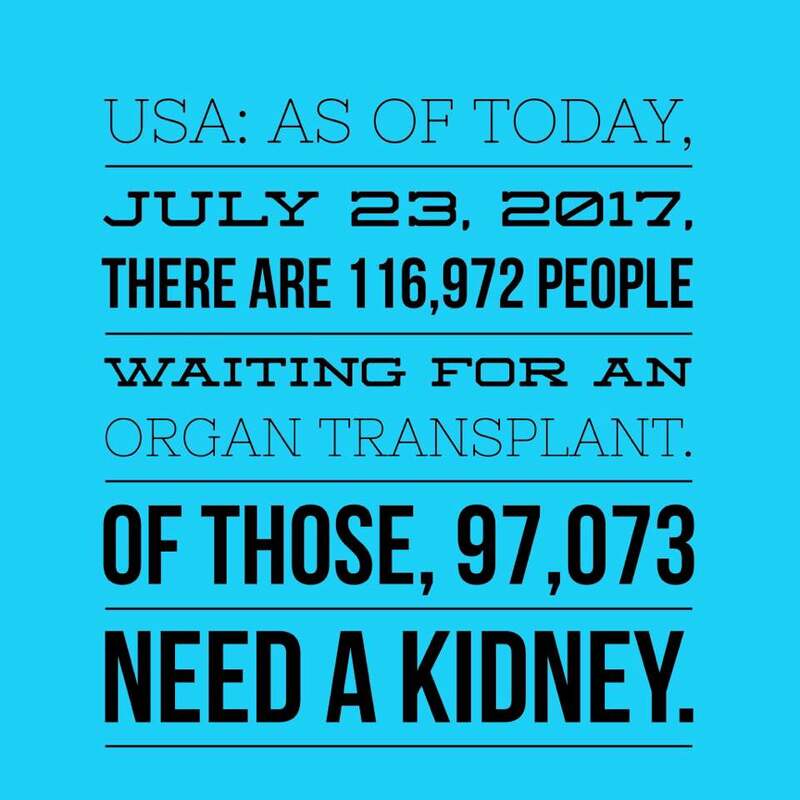 Want to get more people to consider stepping up to donate a kidney? Invite a kidney donor to your next meeting: house of worship, civic group, neighborhood cookout, anywhere. There are so many misconceptions about donating. If you don't know someone in your area, visit my favorite website, The Living Donor Network, www.ldkn.org. In addition to the information that's included, the founder, Harvey Mysel, offers webinars to field questions. By the way, if you live in the southeast, I'm willing to travel. If you live further out, we could hold a Skype session. Interested in more ideas about how to get started? Contact me: lisa@lisahetzel.com I'd love to help you.